The Neapolitan naval hero, Admiral Francesco Caracciolo, is the eponym for the long seaside road along the Villa Comunale. The prominent statue on that road, however, is of someone else —WW I general, Armando Diaz. He, of course, is nowhere near "his" street, the road named for him, but his spot on via Caracciolo is also a pleasant place to stand. It looks out at the sea, away from the confusion. He can stand there forever and puzzle over the fact that after he signed the armistice for Italy in the Great War as “firmato, Diaz” [“signed, Diaz”] a great many newborn Italians that year wound up being named “Firmato” by parents who figured it must have been the general’s given name. 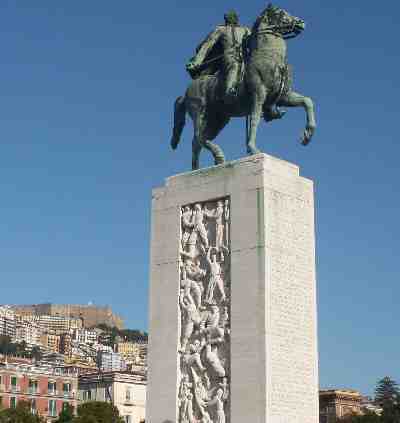 There is a gigantic monument to "Firmato"—a tall pedestal topped by Diaz astride a horse, on the sea front along via Caracciolo. The design of the monument is by Gino Cancelotti, and the bronze statue, itself, is by Francesco Nagni. The monument was erected in 1934. At the outbreak of WWI in July of 1914, Italy was officially a member of the Triple Alliance with Germany and Austria-Hungary but did not adhere to the alliance and did not enter the war on the side of Germany and Austria. The reasons are complicated but essentially had to do with Italy's irredentist designs on territories in the north then in the hands of Austria. Thus, Italy joined the Triple Entente (France, Britain and Russia) and went to war against Austria-Hungary in May of 1915. At the time, Diaz was on the general staff, but the Commander in Chief of the Italian forces was general Luigi Cardona, under whose command the Italian army was routed at the infamous Battle of Caporetto in October and November of 1917 (best known in English-language literature through the description in Ernest Hemingway's A Farewell to Arms). Diaz replaced Cardona and is credited with reorganizing the Italian war effort and stopping and then defeating the Austrians, enabling Italy to end her WWI efforts successfully. 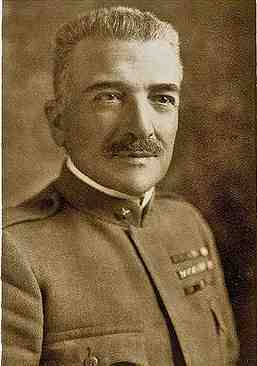 The reputation of Diaz as a military commander rests on two episodes: (1) his victory in holding the line at the Piave river in June of 1918 against Austrian advances after the Caporetto fiasco. The stand at the Piave became so emblazoned in Italian consciousness by a song entitled The Legend of the Piave (composed by E.A. Mario in 1918) that the song became the national anthem of the Republic of Italy after WWII for a few years; and (2) his victory at the later battle of Vittorio Veneto in late October of 1918. He was brilliantly cautious and unwilling to sacrifice troops for nothing. It was an extraordinary defensive tactic in which Diaz' army held fast and inflicted disastrous casualties on the attacking Austrians. Diaz was criticized for not immediately pursuing the broken Austrian army, but he wisely chose to let contemporary political events take hold. They did: bits and pieces of the Habsburg empire crumbled very quickly in the face of the defeat; Hungary left the union with Austria, and the Slavic minorities (the future Czechoslovakia and Yugoslavia) revolted. Vienna informed her wartime allies in Berlin that Austria could no longer pursue the war, and Germany, with troops still in France (! ), was forced to ask for an armistice, which took effect on November 11, 1918. The battle of Vittorio Veneto turned out to be the last major battle of the Great War and was crucial in breaking the stalemate that had sapped Europe for four years. The document referred to in the first paragraph above as "armistice" is called in Italian "the Victory Bulletin" (Bollettini della Vittoria); it is a brief but dramatic account of the Italian victory over Austria in WWI and was issued on Nov. 4, 1918. The original text was then fused in bronze from captured enemy artillery pieces and copies of the text are to this day displayed in barracks and city halls throughout Italy. It is one of the "foundation documents" of the modern state of Italy. After the war Diaz enjoyed a number of honors as the great hero of the Great War, including being knighted by king Victor Emanuel III and proclaimed the "Duke of Victory." He took trips abroad and was honored in the US alongside other luminaries from the Great War such as general John J. Pershing. If there is one uncertain spot —and this with extreme hindsight— in the life of one of Italy's great patriotic heroes, it has to do with Mussolini's march on Rome. The march took place from 22 to 29 October 1922 and was an obvious, bold maneuver by Mussolini (whose Fascist party was already represented in parliament) to propel himself to real power. It worked. The march, itself, of Fascists, was composed of fewer than 50,000 persons; yet, they were converging on the capital. It is well-known that the king did not call out the army to stop the Fascist black-shirts from reaching Rome. The back-story is that the king had apparently asked Diaz whether the army could be counted upon to stop the marchers if it became necessary. Diaz said they would follow orders, but it was perhaps not a good idea to put the army to the test of having to shoot down a great many of their fellow Italians under such circumstances. Thus, Mussolini came to power, and Diaz, at the behest of king Victor Emanuel III, then accepted the post of War Minister. Like another Italian military hero, Giuseppe Garibaldi, however, Armando Diaz had absolutely no political ambitions, and he quickly retired to private life in 1924. Diaz passed away in February of 1928. His funeral was an affair of state with both Prime Minister Mussolini and the king in attendance. Thousands followed the procession in Rome that bore the body of Diaz with full military pomp and ceremony to the Vittoriano, the "altar of the Fatherland", Italy's grandest patriotic monument, the monument to king Victor Emanuel II, the first king of united Italy. Diaz lay in state for 24 hours and was then interred in the church of Santa Maria degli Angeli e dei Martiri in Rome. Obituary notices from around world were glowing and spoke of him as the "savior" of Italy. It is not an exaggeration to say that Armando Diaz is second only to Garibaldi as a patriotic hero in Italy.